The First photo is from a one-day photo trip with some of the guys from the Nikon photo club, we spent an entire day at Stevns, a peninsula on the east coast of Zealand, if you go to Stevns Church, you’ll finde this small house right next to it. It was an incredibly beautiful day, there was not a cloud in the sky, and although there were only a few plus degrees Celsius, it was still hot enough to leave the long underwear at home, it wasn’t the first day of spring, but close. It was a nice ride, the first time I tried to take a trip with other some other photo geeks, but certainly not the last time. The photo is made from 5 RAW exposures, converted to HDR in PhotoMatrix and adjusted in Photoshop, I’m not so sure about the blue shadows, I’m considering taking the image back into Photoshop and desaturated shadows so the blue disappears, but on the other hand I also like the blue tone very much, it stands in good contrast to the warm (yellow) sun. and it also gives you a feeling that it is a chilly spring day, not a hot summer day. 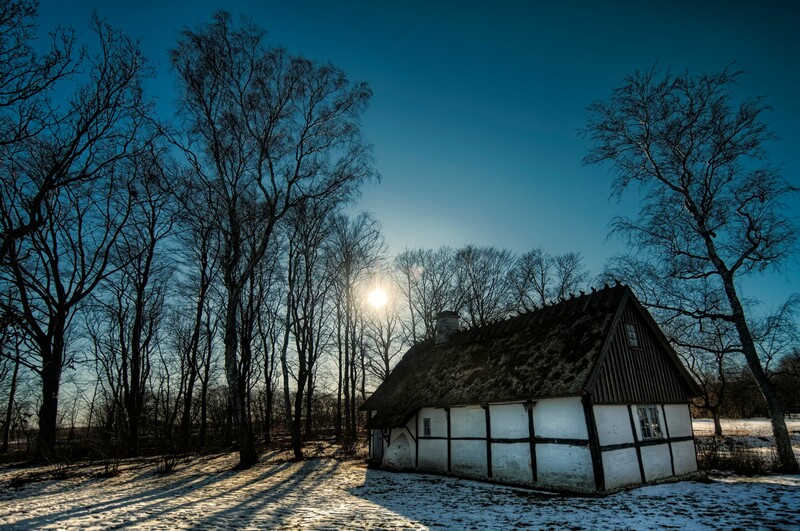 The blue shadowed house by Bo47 is licensed under a Creative Commons Attribution-NonCommercial-NoDerivatives 4.0 International License.